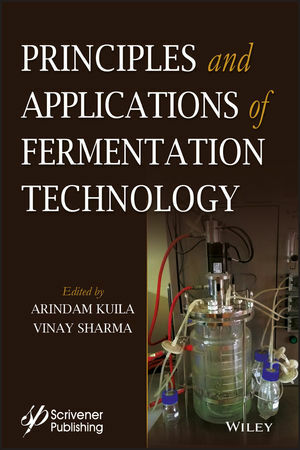 The book covers all aspects of fermentation technology such as principles, reaction kinetics, scaling up of processes, and applications. Arindam Kuila is an Assistant Professor at the Department of Bioscience & Biotechnology, Banasthali University, Rajasthan. He obtained his PhD from the Agricultural & Food Engineering Department, Indian Institute of Technology Kharagpur, India in 2013. He is the co-editor of "Lignocellulosic Biomass Production and Industrial Applications" (Wiley-Scrivener 2017), co-author of at least 11 peer-reviewed journals papers and 5 patents. Vinay Sharma is Dean, Faculty of Science & Technology and Chair, Department of Bioscience & Biotechnology at Banasthali University, India. He has over 30 years of teaching and research experience and has published more than 250 research papers (including 31 as conference proceedings/ book chapters). He has also authored/edited 6 books including "Lignocellulosic Biomass Production and Industrial Applications" (Wiley-Scrivener 2017).